As my regular readers likely know, I’ve been brewing a long time. December 2016 marked my 20th anniversary as a home brewer, which means I’ve seen a lot of fads come and go. One semi-constant though that time has been the (formerly) American (now) West-Coast style IPA. Resinous, bold, with a bit of balancing sweetness – this was a style I brewed a lot as a new brewer, and one which I continue to enjoy through to today. Sadly, the classical 90’s style IPA gave way in the early 2000’s to the bitterness wars, which saw IBU’s climb into the stratosphere and the concept of “balance” lost to a chest-thumping “hold-my-beer and watch this” mentality. IBU ranges have since fallen to more reasonable levels, however the classical (cascade/centennial hopped pale + crystal malt) 90’s style IPA seems to have faded from popularity, to be replaced with other malt bills and more modern hop varieties. So for this brew I went back to my old log book – 1997 to be exact – and rebrewed an IPA that used to be a regular part of my brewing rotation…with two slight hat-tips to modernity. The first change is a recipe change – the old recipe had 1 kg (2.2 lbs) of crystal 20, plus 0.5 kg (~1 lb) of crystal 60, which made for a very sweet finish. I replaced the C20 with an equal weight of Vienna malt. This will retain some malt character/sweetness, but reduce the crystal-forward nature of this old recipe towards a more modern interpretation. The second change was that I moved all of the flavour and aroma additions (e.g. 10, 5 and 0 min additions) to a single 30 minute whirlpool addition. 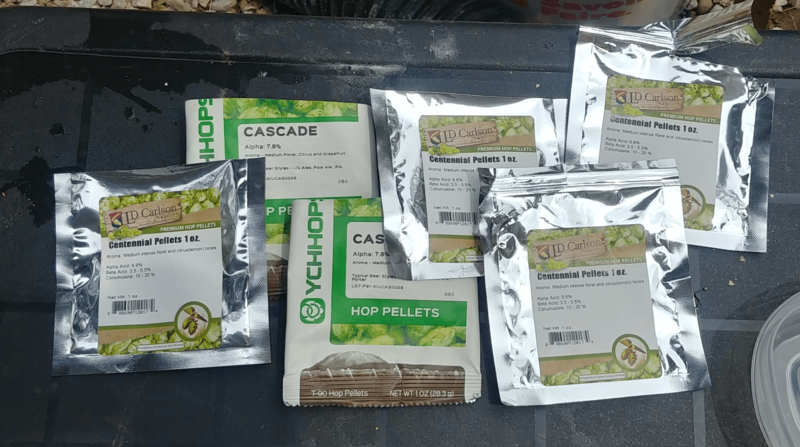 My recent experience has convinced me that whirlpooling is the best way to pull the most flavour and aroma out of the hops. I have to admit that I had more than my usual amount of fun and nostalgia with this beer – I even went back to using dry yeast, something which I rarely do these days given my library of over 300 yeasts. 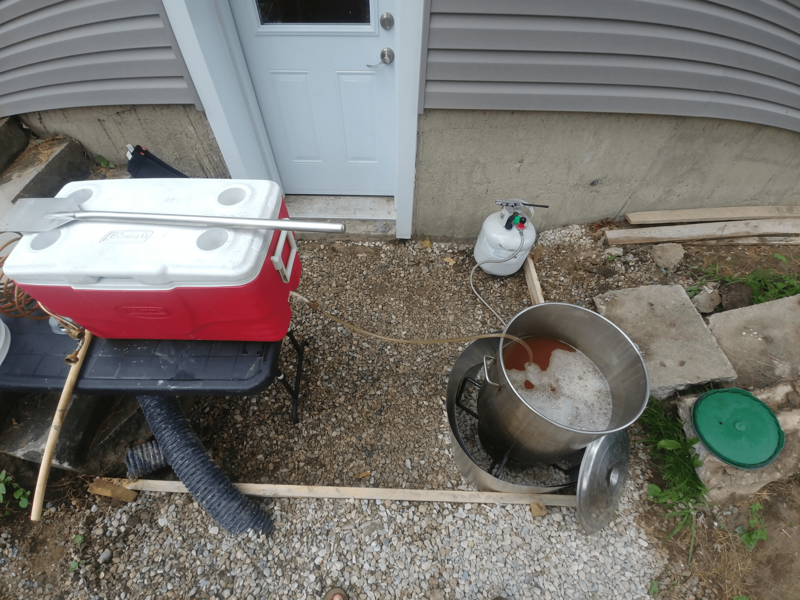 This was also the first time brewing since we started free-ranging our ducks. Let me tell you, its a bit of a challenge brewing when every time you open the mash tun you have 13 excited birds trying to eat the grain! As with all my beers this year, I’m sticking with the Scifi/Dystopian naming theme this year…this time naming the beer after one of the biggest movie hits from 1997…which was loosely based on what was at that time, one of my favourite novels (written in 1959). Appearance: Coppery, with a slight hop haze. Head is stark white, with medium sized bubbles. Aroma: Aroma was appropriate for a late-90’s IPA, meaning there is a nice citrus and resin hop aroma. But by modern standards the hop aroma is a little lacklustre; when I rebrew this IPA I will be double the amount of hops in the dry hop. Flavour: This is the IPA I remember! Upfront is a strong resinous bitterness. Not the modern “clean” bitterness of a hop like warrior, but rather a bitterness that grabs you by the epiglottis and doesn’t let go. This is quickly followed by an intense pine and citrus character, balanced nicely with a rich sweetness and toast character from the C60. The aftertaste starts as the bitterness stubbornly holding onto your epiglottis, which fades over a surprisingly long time, leaving a slightly sweet grapefruit note that slowly fades away. Mouthfeel: The beer has a medium body that stands up well to the higher bitterness and resinous hop character. Overall: This is a slightly modernized take on the classical 90’s style IPA. A fairly intense “course” bitterness, balanced with crystal malt and citrus/resinous hop flavour. Intense, and yet easily drinkable at the same time.